Recently I reviewed a new spacerock project from UK’s Keith Hill called Oceanfire. Keith also plays in the band Civilian Zen. I can hear how he drew on his Civilian Zen experiences to create the Oceanfire sound, but Civilian Zen is a different beast altogether. Consisting of Mark Andrew Broster on bass, vocal chants and FX; Ralph Wordenweber on drums, midi drums, and percussion and Keith Hill on guitars, vocals, programming, FX, 303, midi guitars, synths, and samples, Civilian Zen’s Otherworlds EP is a collection of songs that were recorded in and around the recording sessions for New Worlds, their 2012 full-length release. 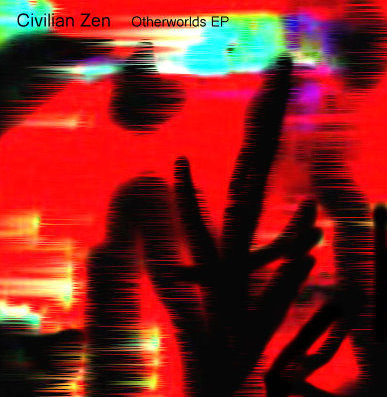 Civilian Zen’s spacerock approach draws heavily on electronic dance music styles as the backbone of its sound, but on Otherworlds, although a couple of the songs head in this direction, the band takes some time to chill, most notably on the 10-minute epic Possessed With the Pleasures of Chance. The largely frantic pace of New Worlds is replaced here with a more eclectic aesthetic. While songs like Havok and the title track do utilize those rapid, pulsing rhythms of electronica, the rest of the EP takes some different turns. Introdrone, is kind of self-explanatory, but it is by no means a quiet drone, more like the drone of industrial machinery. On the Hour is a dreamy pop piece with a light rhythm and drifting guitar textures. And the aforementioned Possessed With the Pleasures of Chance is a spacious ambient exploration that nonetheless bristles with energy, as if its placid surface is about to boil over with murky sound effects like explosions and airplanes. Weird, distorted chants even give it a bit of spiritual feel. This last track, especially, is a world away from the music on New Worlds. But I guess that’s why the EP is called Otherworlds! In short, if you like edgy, experimental pop with many different textures, you’ll enjoy this EP from Civilian Zen.